"[REED] Isaac and Experiance [Experience, M.R.] Willis, Feb. 11, 1729-30." Vital Records of Sudbury, Massachusetts to the year 1850 (Boston, Mass. : New England Historic Genealogical Society, 1903), Marriages, page 256, Isaac Reed and Experiance Willis entry. Isaac Read (1704-1780) was the son of Thomas and Mary (Bigelow) (Bruce) Read of Sudbury, Massachusetts. 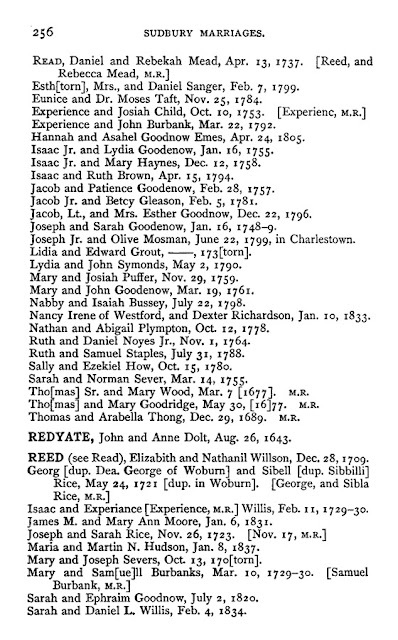 Isaac married Experience Willis (1709-1787), daughter of Samuel and Susannah (Gleason) Willis, in 1730, and they had 11 children between 1731 and 1753. Isaac and Experience (Willis) Read are my 6th great-grandparents, through their daughter Sarah Read (1736-1809) who married Norman Seaver (1734-1787) in 1755.